In celebration of Mandela Day, 18th July 2015, Khobab Wind Farm pledged time and funds to upgrade and refurbish the local school hostel. These facilities house learners attending Loeriesfontein Primary and High School. 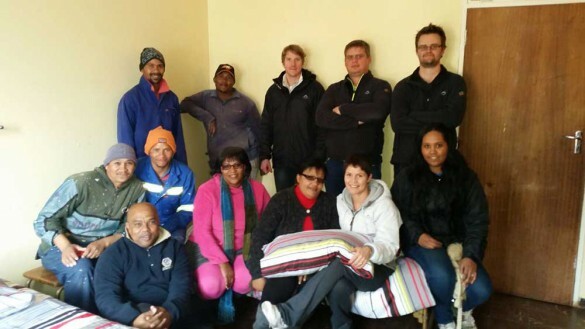 We started the refurbishment to coincide with Mandela Day, a day that is ultimately dedicated to honouring the legacy and values of our former President, through volunteering and community service,” said Kevin Foster, Project Manager of Khobab Wind Farm. There are approximately 60 learners living at Loeriesfontein Hostel, occupying the 24 bedrooms that are being upgraded by the two wind farms. The majority of learners are children from labourers working on surrounding farms, in addition to a small portion who come from distressed families in Loeriesfontein . The upgrade includes repairing cracks on the inside walls, painting the bedrooms, sanding down and varnishing the worn wooden exterior of the wardrobes as well as repainting the insides. To add extra comfort, new colourful bedding, duvets and fitted sheets have also been provided. This is part of the wind farms overall commitment to the children and families of Loeriesfontein and just one of many programmes that will benefit the local community. “Every child needs a good night’s rest in order to perform well at school, and we believe by providing warm bedding and refurbishing the rooms, the learners’ quality of life will be improved,” concluded Foster.